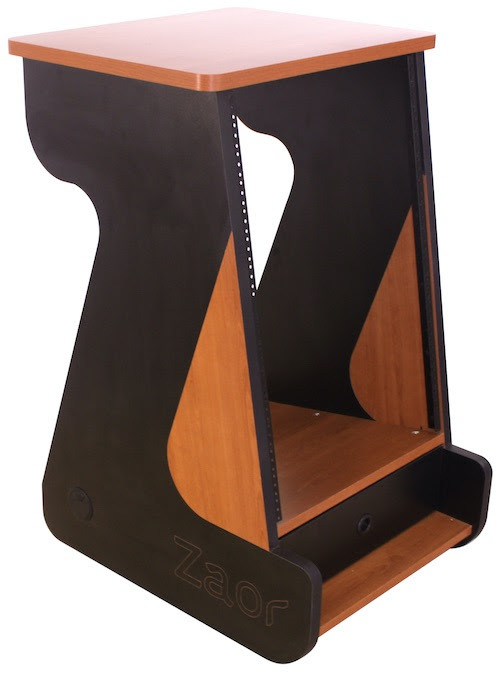 Studio furniture-maker ZAOR Studio Furniture has recently announce availability of several new revisions and additions to its MIZA product line, the MIZA D-Stand MkII desktop speaker stand, MIZA Jr. MkII flexible media desk, MIZA Rack 12 MkII and MIZA Rack 16 MkII side racks, and MIZA V-Stand 36 and MIZA V-Stand 42 speaker stands. 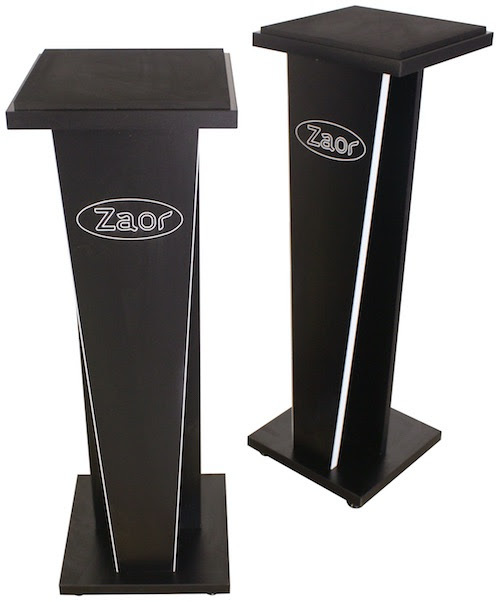 As implied by name, MIZA D-Stand MkII marks ZAOR Studio Furniture’s new and improved revision of its original MIZA D-Stand desktop speaker stand. Benefitting from a more modernised (all-black) look, it includes more features. For starters, it is now height-adjustable by up to 50mm (above its 200mm-high horizontal configuration) and can also be angled at up to 9° while providing better acoustic isolation courtesy of four hemispheres made out of a synthetic viscoelastic urethane polymer that minimises transmission by up to 95%. With weight-bearing capabilities belying its diminutive (260mm x 260mm) footprint — up to 25kg when used horizontally and 15kg when angled, a pair of MIZA D-Stand MkII desktop speaker stands can be added to any desk to turn it into a production environment easily and speedily. 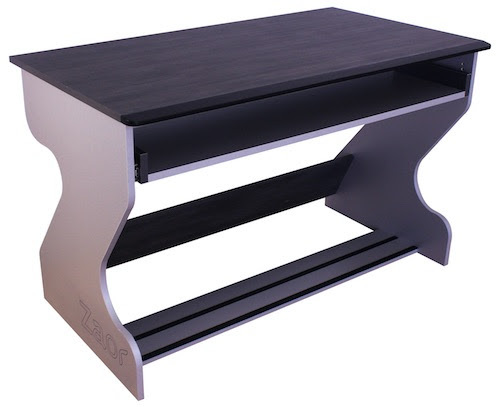 Similarly, MIZA Jr. MkII marks ZAOR Studio Furniture’s revision of its original MIZA Jr. flexible media desk for computer-based workflow while targeting video and audio applications. As such, this time the company set about streamlining the production process, resulting in a reduced RRP (Recommended Retail Price) — down to €439.00 EUR (for MIZA Jr. MkII) from €499.00 EUR (for MIZA Jr.), so the end result remains focused on providing the user with a no-compromise workspace without breaking the bank. Better still, specifications remain remarkably similar to what they were with a perfectly sized (1250mm: W x 650mm: D) top plate for fitting into smaller spaces. Saying that, this is supplemented by a 61-note keyboard controller-accommodating (1129mm: W x 308mm: D) pullout draw, which is height adjustable in seven steps of 7mm, while a lower passageway positioned rearwards retains unsightly cables, conveniently keeping them out of sight. Strongly constructed from Melamine-faced chipboard with a strip of solid wood along the front edge of its top plate for aesthetic and protective purposes, MIZA Jr. MkII is available in Cherry/Black and Wenge/Grey finishes, flat packed for easy transportation and assembled easily. 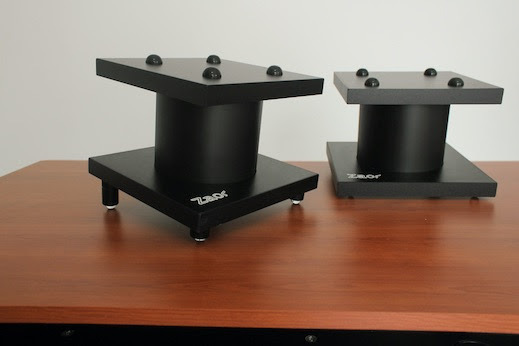 The MIZA D-Stand MkII desktop speaker stand, MIZA Jr. MkII flexible media desk, MIZA Rack 12 MkII and MIZA Rack 16 MkII side racks, and MIZA V-Stand 36 and MIZA V-Stand 42 speaker stands are available to order either directly through the Zaor Online Shop or via ZAOR Studio Furniture’s growing global dealership network with an RRP of €179.00 EUR (per pair), €439.00 EUR, €369.00 EUR, €399.00 EUR, €139.00 EUR (each), and €159.00 EUR (each), respectively. For more in-depth information, please visit the dedicated MIZA product webpages.